We woke to another lovely warm sunny morning. It has made such a difference since the wind finally dropped. Yesterday we decided we probably wouldn't go back across to Gibraltar, we'd done about all the sightseeing we wanted to do. I would have done more, particularly the 100 ton gun and the nearby Nelson's Anchorage, the location where Admiral Nelson's body was bought ashore after the Battle of Trafalgar, but The Chef wasn't that keen. We left the UK with a winter-weight duvet on, and now we've had to face the fact we need a summer-weight. Foolishly I hadn't thought to try and squeeze one in before we left, and so, off we went again, back to The Rock. It was manic, even just approaching the frontier. Today is the first day of the Spanish Easter holiday. So even fewer of them will be working over the next few days, coupled with this a new cruise ship had arrived overnight and they were decanting their flock in to tour minibuses to participate in 'Gib in half a day'. There are also loads of Brit holiday makers here. There have been quite a few flights in and out of here both yesterday and today, maybe up to twenty in total. We can see directly across to the runway from our motorhome. Finally we had hoards of Spanish day-trippers. These were my favourites because it was like taking a kid in to a sweetshop and telling them they can have a look round but you can't afford to buy them anything. So you Spanish can come over and have a look around OUR Rock, spend some money, buy some decent food like fish & chips, taste beer which isn't anything like chilled urine, buy your horrid kids an Easter egg, then go home, and no you can't have The Rock, it's ours, and will remain so. This all made for a very busy border crossing and an even busier Main Street. We headed for Debenhams where we managed to buy a 4.5 tog double duvet for £17. We asked if they also sold the clear bags with valves on them for placing clothing in and sucking the air out to reduce the volume. A shop assistant said they didn't and that she bought hers from Argos in the UK. I said "That's handy, but we're not in the UK". She said she knew of nowhere they could be bought on Gibraltar, and if we found any we should let her know. Well after a few enquiries in various shops up Main Street, The Chef popped in to a linen/hardware shop right across the road from Marks & Spencer and managed to buy one. They only had one size 60cmx80cm, it would be a tight fit, but it was worth a try. That was us done really, we did some more food shopping, as well as buy a 5ltr plastic bottle of water, rather than trust whatever comes out of the taps here. We wanted two really, as our next stop is for four or five nights and we needed to make sure we had enough safe water to drink. As I wanted to take a quick look at La Linea later on, we decided we'd buy a second one there if we could find it. My carrying capacity was limited as I was wearing the backpack full of the bits of shopping and carrying the duvet in its box, now I had to carry the bottle of water. Who needs to go to the gym for a workout? After the walk back across the frontier we set about sorting the duvets. The new summer weight was unpacked and aired across our two folding chairs, next it was fresh food away. Once the new duvet had aired The Chef slipped it in to a clean duvet cover and we were in business. Then out came the winter weight duvet for a jolly good airing. While all this was going on I noticed that the cooling fins in the fridge were about one third iced up. It couldn't be ignored, and so all of the food and drink had to come out and placed in a coolbag and shopping bags then stowed in the rear garage as it's quite cool in there. Boiling water poured in to a stainless steel bowl then locked in the fridge gave us the quick defrost which we needed. After reloading the fridge/freezer it was time to tackle the winter duvet. If we couldn't get it in to the bag and the air sucked out there would be no room to stow it in the garage and would have to lie underneath the mattress topper. With some careful folding and a lot of oooh's and aaah's we got it in to the bag - just. Then with the aid of the Black & Decker rechargeable vacuum cleaner, we sucked as much of the air out as we could. The important thing was that we had greatly reduced its volume and it could then be stored in the rear garage. 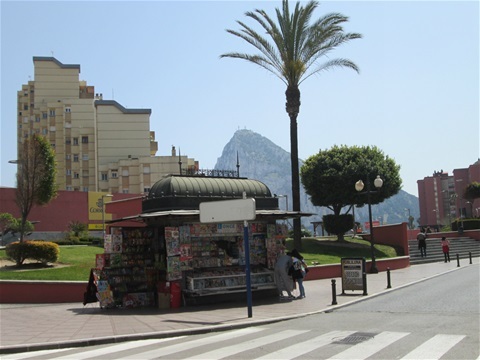 Next we popped out for a look around La Linea, the cunning plan being that since The Chef had forgotten her email password and therefore couldn't use my Mi-Fi (her iPad remembers it) she would take it out with her and we'd pop in to MacDonald's for a coffee and use their free Wi-Fi connection. 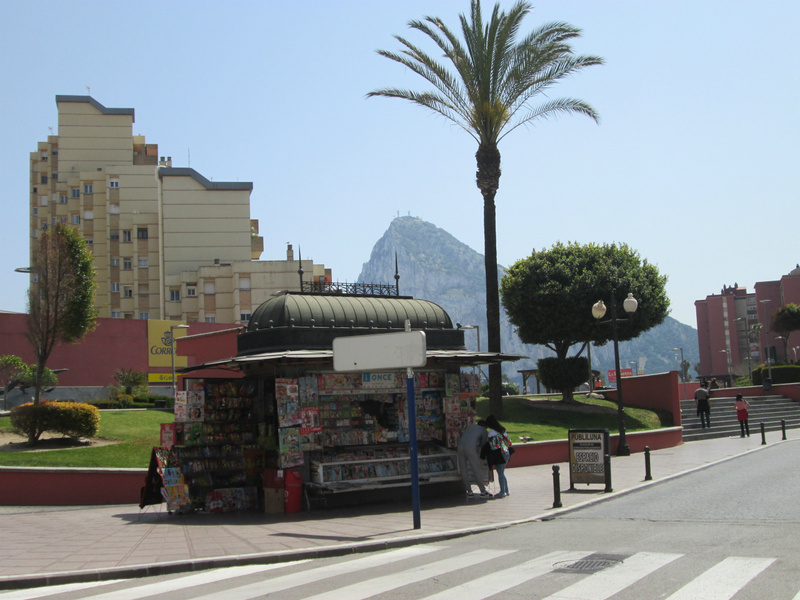 Now La Linea cannot be described as pretty, I took photographs of the entrance to it, the bit that faces Gibraltar. But it's all show. Beyond that, the place is a bit of a shithole and gives some idea of what Gibraltar would look like if the Spanish did get their hands on it. Unfortunately we were sidetracked by the sheer excitement of finding a 5ltr bottle of water at only three times what we paid for it in the Spanish supermarket just inside the Gibraltar border. This meant that we forgot to go to MacDonald's on the way back for The Chef to get her emails. After our evening meal and a coffee we had a wander back to MacDonald's. It was so noisy and busy we managed to get away with spending nothing, just sitting there looking as if we were waiting for somebody to come back from the tills with a tray piled high with food. This gave the Chef time to wind up her iPad, check her emails, there were none it seems, and check the weather forecast etc. After that we left the restaurant with the ringing of excited kids in our ears. Tomorrow we commence the more interesting and demanding part of our trip. First we head for Puerto de la Santa Maria, just up the road from Cadiz. We'll be based on a large car park, and nothing more, that's if the Spanish have left a space for us. From there we hope to get to Cadiz across the bay by catamaran, and on another day visit Jerez. After that we head inland for Seville etc. So it's goodnight from Gibraltar.